You'll know just where you are as you exit the metro at Station Fabre. The women with bindis, accompanied by men in turbans, make it clear this is India. Little India, to be exact, part of Montréal's Park Extension neighborhood. Once you've ascended to street level, the waft of spices hits you — particularly on an unseasonably warm day, a literal Indian summer. It's hard to miss the sari shop — sometimes two — on every block. Park Extension is the most ethnically diverse and densely populated section of Montréal, says Mélissa Simard of 'Round Table Tours, my guide on this expedition. For 60 percent of the population here, the first language is neither French nor English but a tongue native to India, Pakistan, Sri Lanka or Bangladesh. I connected with Simard through the Montréal tourism board, whose staffers heartily recommended her expertise in all things culinary. The McGill University alum has run 'Round Table Tours since 2012, when she's not cooking in a restaurant kitchen or catering. An expert in history as well as food, she's well informed on all aspects of culinary Montréal and seems to know everybody. When Simard takes groups around Chinatown, she introduces them to the neighborhood's famous Dragon Beard candy man, Johnny Chin — with whose son she used to live, she notes in passing. Simard has run tours devoted to Iberian tapas, Jewish bagel shops and delis, and ecologically focused food businesses such as rooftop gardens. Upcoming outings will introduce tourists to pioneering women in Montréal food, chocolatiers and tastings with a tea sommelier. When she's not making new friends (the woman is quick with a hug), Simard is working on a culinary guidebook with Montréal food writer Amie Watson. When I requested a Little India jaunt, Simard was happy to create one — and said she would likely put it on her regular roster. On a recent Saturday, she shared the sights and smells of Little India with some Vermonters. In the 1960s and '70s, Greeks working in the fur trade predominantly inhabited Park Extension. Little by little, those immigrants began relocating to the suburbs, leaving room for the South Asian population that subsequently moved in. At our first stop, Simard introduced me to Eleni Tsakiris, who straddles both those worlds. The Athens native owns a Punjabi restaurant called India's Oven. Opened in 2007, the restaurant has earned a reputation for making some of the city's best north Indian cuisine, thanks to chef Gurwinder Singh. Simard ordered a few key items that she thinks best represent the restaurant. Fish pakoras were saffron-orange and flavored with a marinade of yogurt, garlic and ginger, as well as a smattering of cracked pepper. Filled with moist, white fish, they were about as light as a fried food can be, and were accompanied with shredded daikon, a tangy turmeric sauce and a deep-green mint chutney. Malai kofta consisted of paneer balls that melted the moment they hit my tongue, served in an ultra-rich sauce that tasted more European than subcontinental. "Me, I cannot live without you tasting the butter chicken," said Tsakiris, arriving at the table with an extra treat. Her restaurant's version of the dish is reputed to be the best in Montréal, with a clear British influence. The strips of chicken were tender, and the deep-orange sauce was as indulgent as the malai kofta's. But we didn't eat too much of anything we were offered here, even the exceptionally flaky naan. We had to save room for three more stops. After the creamy crush of Anglicized Punjabi fare, some lighter breakfast dishes provided a cleansing fire. Rajni and Rajesh Chopra, owners of Indian Curry House, hail from Punjab themselves. But since opening their restaurant in 1995, they said, they've noticed a demand for South Indian specialties such as dosas and idli that are difficult to find in the city. 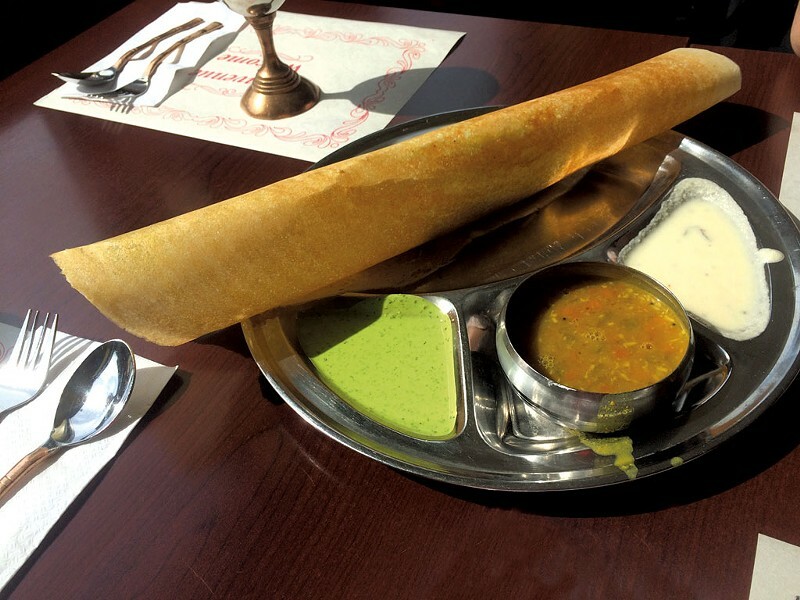 Even today, Montréal has only one exclusively South Indian eatery: Thanjai Restaurant in the Côte-des-Neiges neighborhood. 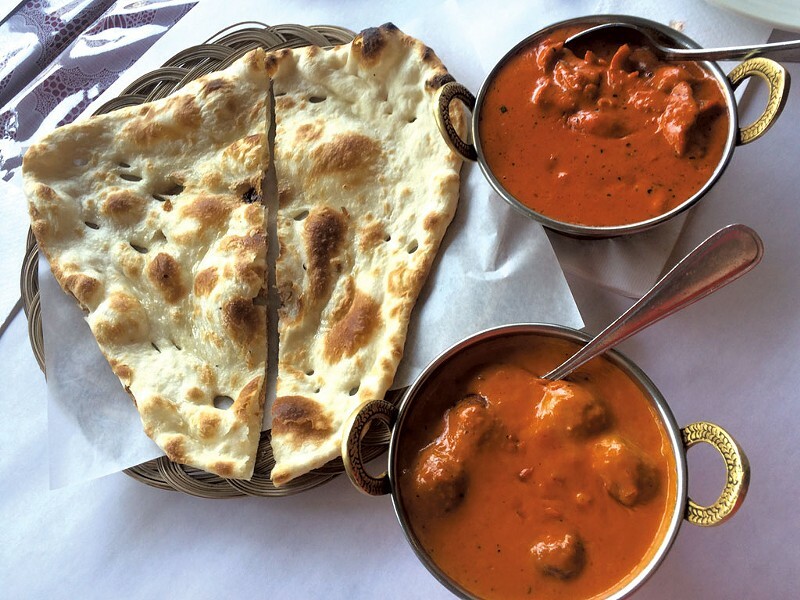 At Indian Curry House, the Chopras split the difference, offering the southern cuisines of Kerala, Tamil Nadu and Andhra Pradesh alongside northern dishes. We came for a plate from each region. Chana bhatura, from the north, filled one thali dish. The chana, or chickpeas, were stewed in a lightly spiced, tomato-based sauce, then covered in raw onions and cilantro. They came with two pieces of bhatura, a fried, dimpled flatbread that looked and tasted like a less inflated poori. On the side, a small lettuce salad was enlivened with achar, or Indian pickles, dominated in this case by carrots. On the plate representing the south, the crispy fermented-rice crêpe known as a dosa, was rolled around aloo masala, bright-yellow potatoes dotted with mustard seeds. The lentil stew called sambar was more watery than spicy, but a smooth coconut chutney and a cool green one combining mint and cilantro supplied more than enough flavor. We walked to our next destination with our lips burning. 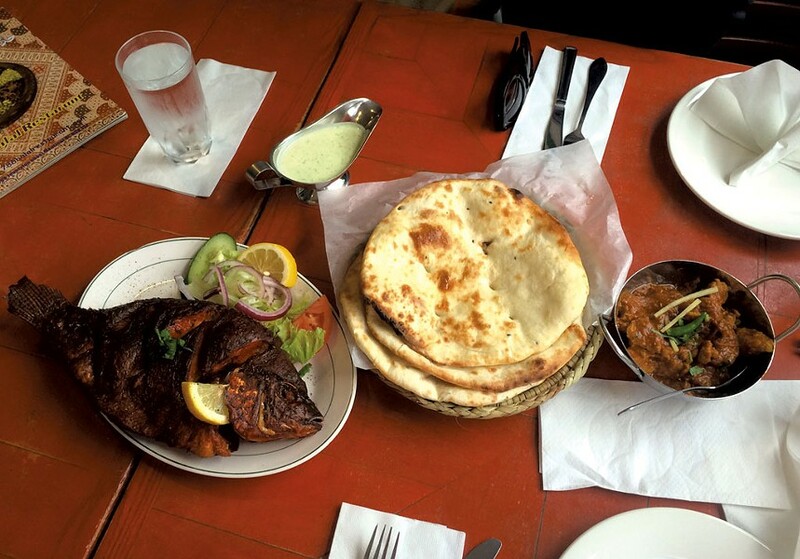 Little India is filled with Pakistani natives, yet 786 Halal is the only restaurant there that devotes itself solely to the cuisine of India's neighbor. That's evident from its name, reflecting the nation's Muslim majority. The number 786 is the numerological representation of "Bismillah al-Rahman al-Rahim," an Arabic phrase roughly meaning "In the name of God, the most gracious, the most merciful." Muslims believe the number brings great luck, explained 786 manager Musa Junaidi: "They look for a 786 model when they buy a car and play it in the lottery." Downstairs from the restaurant, a grocery called Marché 786 keeps customers extra lucky with uncommonly sweet Pakistani mangoes. The restaurant occupies a space that was once a Greek seafood restaurant, and the bathrooms still have portholes on the doors. But the food is pure Pakistan. Curries are available with chicken, lamb or veal — unlike Hindus, Muslims have no prohibition against eating the flesh of cows. The restaurant uses veal because it's more tender than beef, Junaidi said. We tried a boneless-lamb curry. Red and green chiles lent their heat to the moist morsels of meat, which were mixed and topped with matchsticks of ginger for an extra punch. It was an exceptionally complex stew, served with ghee-brushed, nigella-speckled naan. But barbecued whole animals are 786's calling card. Whole chickens called charga are marinated much like tandoori chicken, but also crisped in the fryer. Tilapia gets a similar treatment. The whole fish came to the table red with turmeric and chile powder rubbed into its crosshatched flesh. A lemon slice was tucked beneath the gills. Squeezing it over the moist, crisp-skinned fish yielded an unfamiliar dish that somehow still tasted like home. Punjabi farmer Gurnam Singh Malhi came to Montréal for a better life in 1992. He studied Indian sweet making with a friend of his father's in Toronto before opening Malhi Sweets in 1996. Within two years, however, savory flavors had replaced his sweet barfi and jalebi treats. "Sweets come once in a while. People eat food two times a day," Malhi pointed out. And his food is exceptionally fresh. His wife, Gagan Deep Malhi, prepares a menu of curries, biryani and street snacks using chiles grown and roasted in their yard. A $3.50 chana samosa plate offered far more than the fried appeal of its central potato-and-pea pie. The samosa was barely visible beneath an avalanche of spiced chickpeas, achar, tamarind chutney and chopped onions and herbs. With each bite delivering a whole new flavor, it was fresh snacking at its finest. 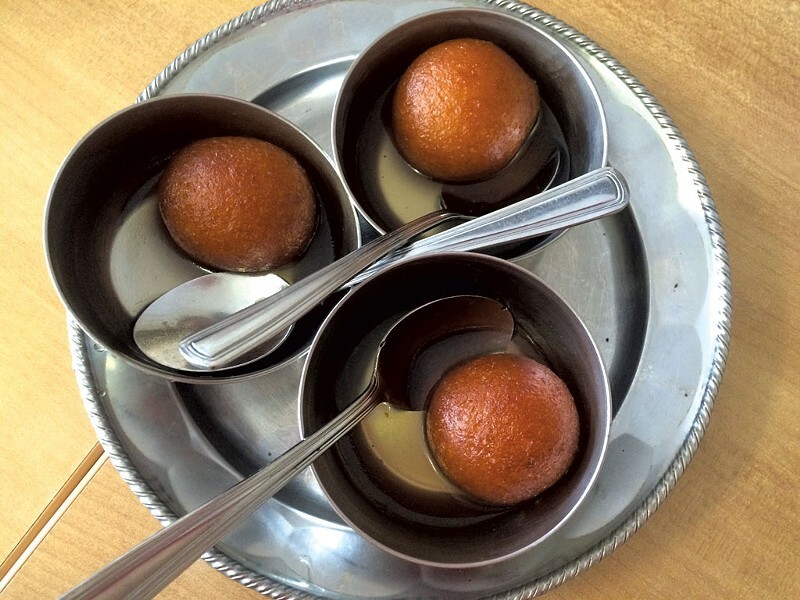 Diverging sharply from his restaurant's original concept, most days Malhi offers only one dessert: a gulab jamun, which he said is the foundation for all Indian sweets. His version is particularly simple, just a single deep-fried ball made from milk solids, resting in a puddle of sugar water in a silver dish. It lacked the florals and spices that usually characterize this sweet. "Rosewater is like makeup and perfume," Malhi explained. "I want natural beauty." An array of sweets won't be returning to Malhi Sweets anytime soon. "They would smell very quickly of onion and garlic in our kitchen," Malhi said with a shrug. At his restaurant, a powerful dose of aromatic spice is sweet enough. The original print version of this article was headlined "Indian Summer"